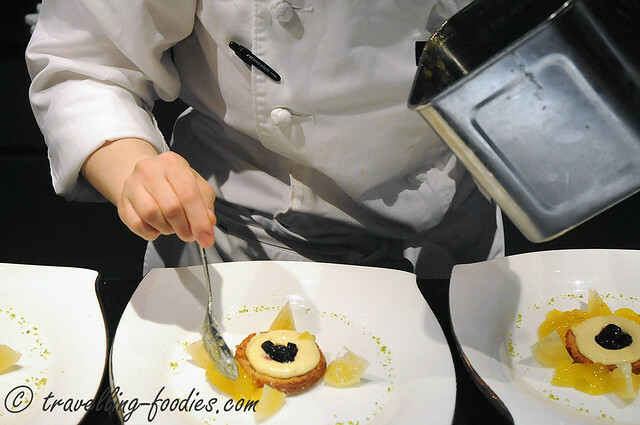 It seems like a growing trend, that people are no longer satisfied with “just” being able to savour the desserts and pastries off their plates, but they’d also like to see how the desserts are being prepared right before their eyes. 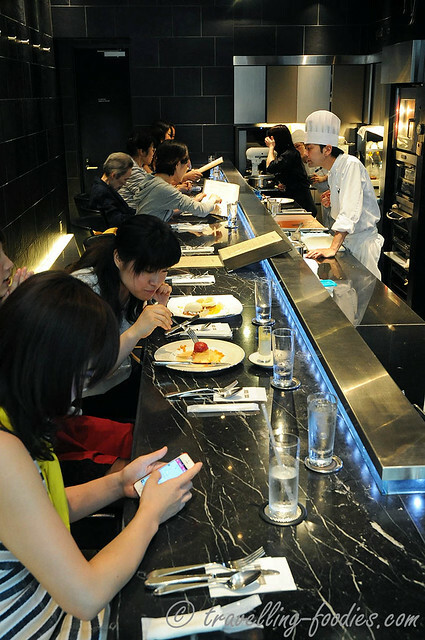 I see this as an extension of gastronomic experience which probably first stemmed from stepping into a sushi bar where a Jiro-like Japanese chef puts on a performance of, selecting a suitable cut, slicing the fish to precision, grasping the perfectly flavoured sushi rice so elegantly in one hand before clasping the two components together. 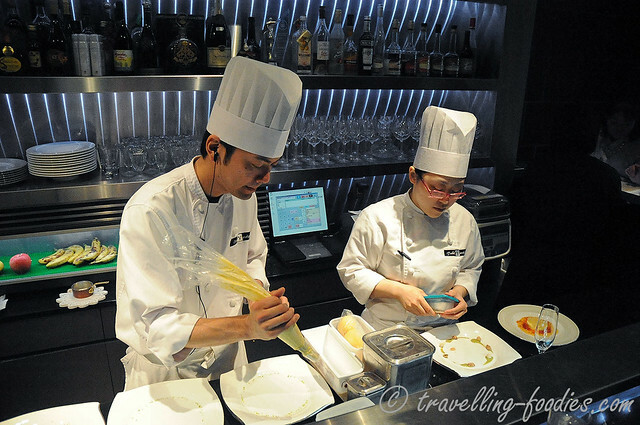 It is a performance which many believe can invigorate the senses during the “omakase” as well as help one to gain a deeper understanding of the food in order to better appreciate what is being eaten. Such a dramatic show is a tradition is not unique to just Japanese of course, as a good crepe suzuette is often prepared from scratch right next one’s dining table, from the making of the lace-thin pancakes, to the final flambe of the orange juice and liqueur concoction. 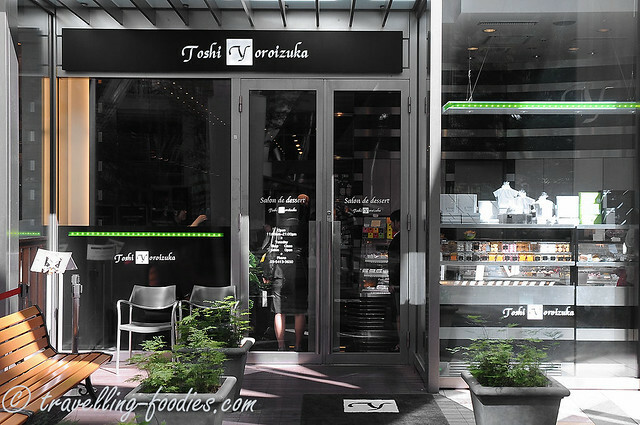 As such, “salons” or “ateliers” becomes an increasingly popular culinary concept which is replicated in many places now. 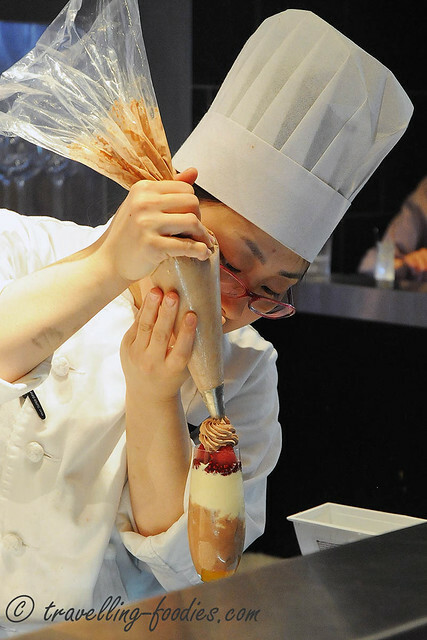 During our most recent trip to Japan, we visited Salon de Dessert Toshi Yoroizuka in Tokyo Midtown , for a treat of not only their desserts but also the performance. 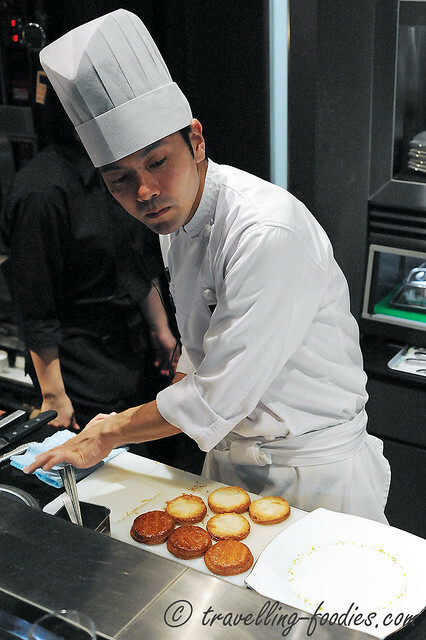 Like a sushi deli in Tsukiji, Toshi Yoroizuka‘s Salon de Dessert has very limited seating, all dedicated over the bar counter where one can enjoy the food and also a full view of how the in-house patissiers prepare them. We had to wait a very short while as it was “full house” at the moment we went. But it wasn’t long before we were ushered to our seats and thankfully, we were given those right in the middle of the house, with the chef right before our eyes. Don’t speak a word of Japanese? Not to worry because they have English menus as well, showing the construction of all the creations which are crafted in situ. We were told that the menu changes periodically, depending on the the ingredients, more specifically the fruits that are in season. While we wait for our dessert to be made, we were treated to a “pistachio dessert cream” which is topped with “crunchy noodles”, probably serving as a palate cleanser as one usually steps in here after a good lunch or dinner elsewhere. 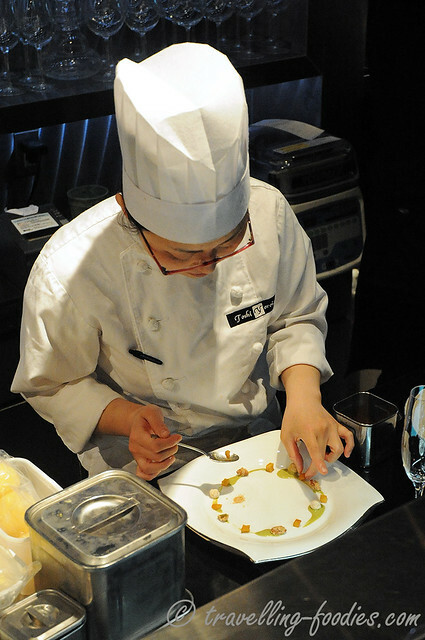 And here is the other placing the chunks of hyuganatsu, one of the Japanese citrus used in this dessert carefully on the plate. The lowest layer done… with a layer of pastry being piped with amanatsu cream over it and a dollop of blueberry compote “hidden” within. 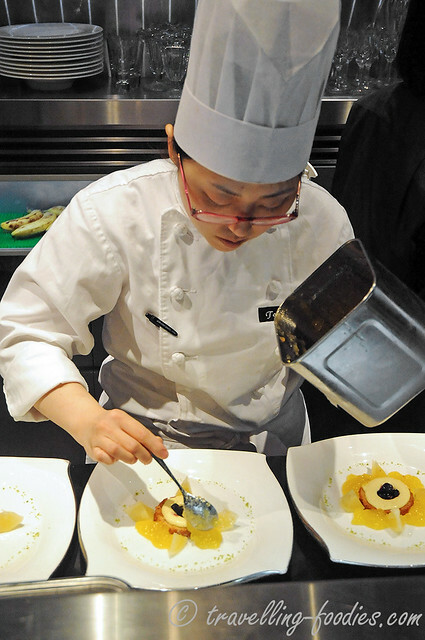 Sometimes, the chefs work on their own individual pieces. Sometimes, they come to assemble a piece together. All was timed and done in clockwork precision, like they knew exactly whom to handle which component at what time. 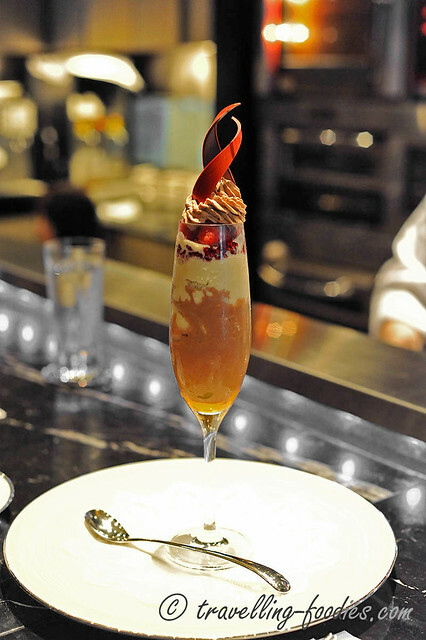 “Parfait au Chocolat a la Toshi” is an interesting piece. It comprises of two types of ice-cream, the darker lower layer being chocolate while the lighter one is actually made from tonka beans. It is topped with a layer of raspberry sauce. Chocolate cream is spiraled over the top before being fixed with 2 pieces of chocolate decor, likening the flame from a torch ablaze. 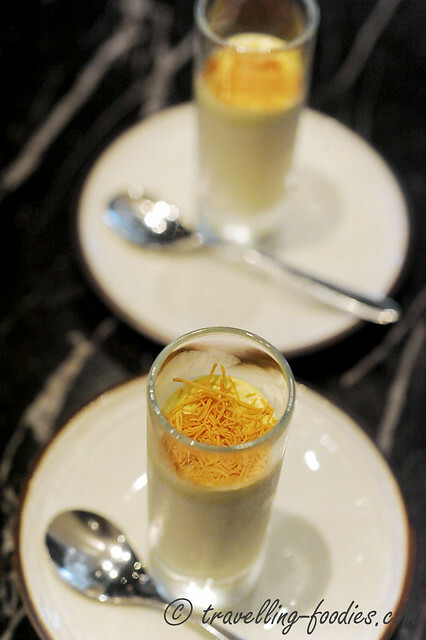 The hidden component in this dessert are the morsels of apricot at the base. Our order of “Mille-feuille a la ‘konatsu‘” which is basically made up of layers of freshly baked puff pastry sandwiched with amanatsu cream. 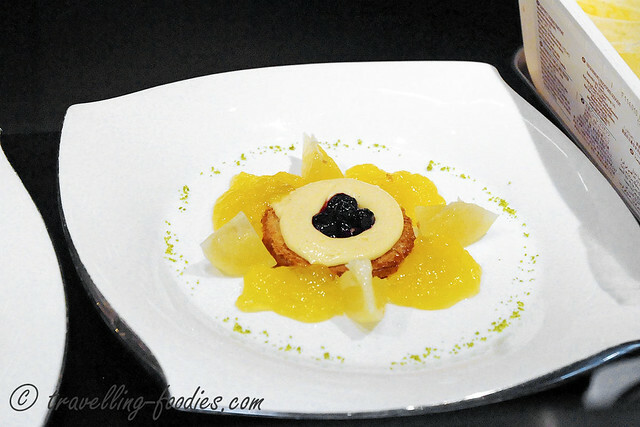 There is a blueberry compote component in the lowest layer while the middle has small chunks of hyuganatsu chunks embedded within the sweet citrusy cream. 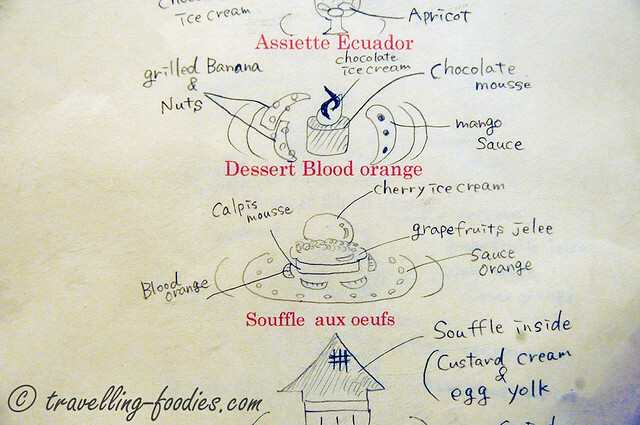 The top is a quenelle of coconut ice-cream which was so yummy. I chuckled as I read the labels on the menu because it was most definitely named in a “tongue in cheek” manner as the other name for the hyuganatsu citrus is actually “konatsu” sounding so similar to the Japanese pronunciation of the ice-cream “kokonatsu“. I take to this dessert very naturally because I love Japanese citrus from the aromatic yuzu, to the zing from sudachi and of course the sweetness from amanatsu mikan. Our second dessert “Dessert Blood Orange” which is yet another citrus themed creation. The base is a disc of Calpis mousse, ingeniously made from the popular Japanese soft drink. It sits in an orange sauce surrounded by wedges of blood orange. Above it is some grapefruit jelly and then a disc of the same “crunchy noodles” as in the “pistachio dessert cream” we had earlier and finally a scoop of cherry ice cream. The flavour profile for this piece is more sourish than sweet, to woo the lady crowd but I like it as well. Lots of play with the textures as well in this piece, wonderfully balanced. Overall, it was quite a good experience admiring the chefs at work while enjoying the desserts at the same time. It allowed us a glimpse of how they would have worked in the kitchen, constructing the masterpieces and working on the orders. The desserts are quite delicious as they are. Despite being slightly more expensive (ranging around 1200 Yen for each plated dessert) than what one find in desserts from those takeaway counters in departmental stores, I felt that it was good “entertainment value for money” to experience it at least once. And for a dessert lover like me, we would definitely be back again! 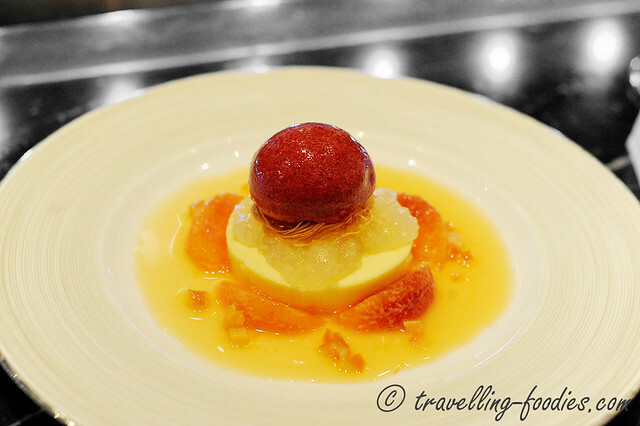 This entry was posted on November 30, 2015 by Alan (travellingfoodies). 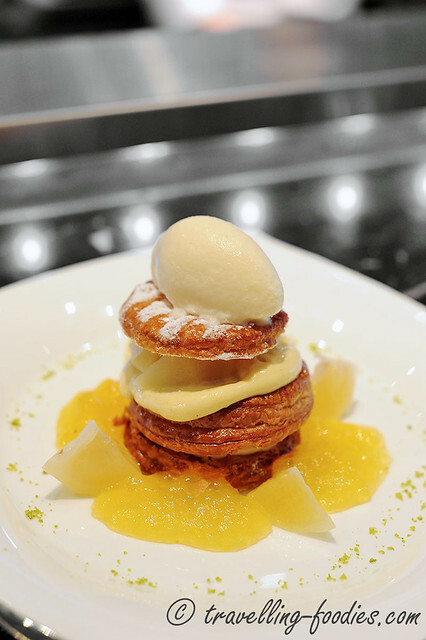 It was filed under Food, Travel and was tagged with blood orange, french pastry, Japan, le salon dessert, Midtown, Patisserie Toshi Yoroizuka, roppongi, Tokyo.